Bruce Kyle of Microsoft and Stuart Celarier of CheckFree explore the new languages features in C#. 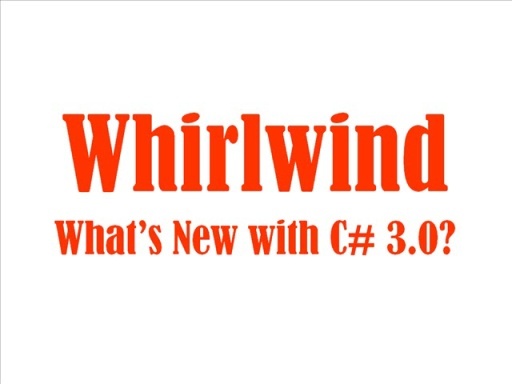 It's a whirlwind tour of the important language features since C# 1. Stuart describes the feature and why it is useful. But doesn't get into best practices nor suggested usages. Just the facts about the feature. Whirlwinds are bite-sized webcasts, each is shorter than 15 minutes. You can start anywhere in the series to learn about the parts you're most interested in. Part 5 is about automatically implemented properties, type inference, and initializers. These are features that can save you tons of typing. These features are part of C# 3 in .NET 3.5. 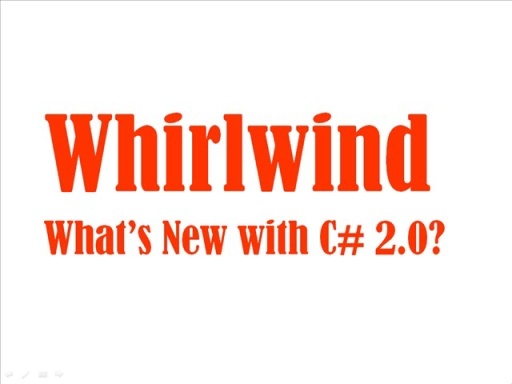 Discover the entire series on C#. For the latest news for developers and ISVs, see US ISV Developer Community blog. There's also an erratum for the collection initilizer shown at 8:55.